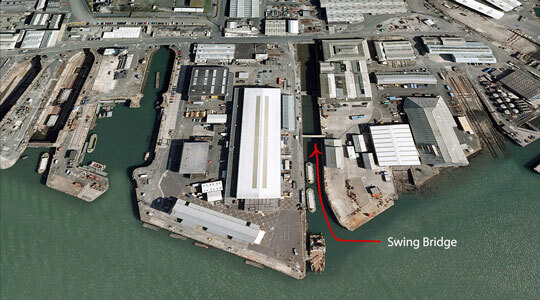 The Swing Bridge location inside the dockyard, image courtesy Google July 2013. 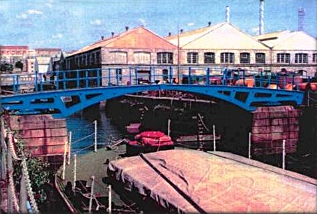 The swing bridge was constructed in 1838 and contains the words ‘Horseley Ironworks (1838) near Birmingham’ on the outer rib. It has a span of 40 feet and the walkway, which is supported on four cross-braced iron ribs, is 8 ½ ft wide. When originally in use the bridge was manually swung open via a series of wheels set into the masonry pillars on the side of the Camber. The pillars can be seen in both images below. Nowadays the bridge is fixed and no longer able to swing open. It is currently a Grade II listed building. 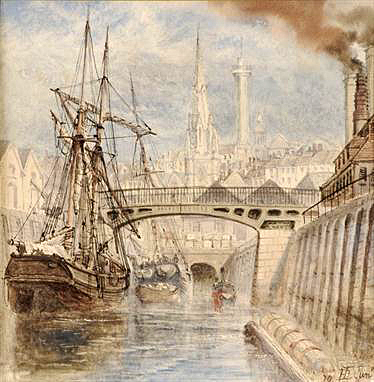 View of the Swing Bridge circa 2001-2002, courtesy of John Wilde Design Ltd.
An 1870 watercolour and ink of the Swing Bridge by Henry Thomas Dawson Jnr. From the bridge and Camber, Devonport Column and St Mary's Church could be seen in the distance. The current handrail looks different from the Victorian handrail in Dawson's 1870 painting: whilst that may have been artistic licence by Dawson it probably was different then, since the current one certainly appears 20th century utilitarian in design.